In Abyss: The Wraiths of Eden you get to save your fiance. What a noble thing to do! The game is a masterpiece in all of the aspects. You get to solve many mysteries and puzzles in the deepest places and be a part of this great love story. Yes, you are to go down to the depths of the sea to find your love there and rescue him. Yes, you play as a female hero. What happened with the knights that save their princes?! Anyways, that's the way it is in Abyss: The Wraiths of Eden. This whole underwater theme is kind of unique. At least for now. And it is a great source of absolutely stunning and attractive locations. The colors and details make it really enjoyable to travel from one place to another. The music and sounds and voice overs are just as great, and they totally match the atmosphere. The gameplay is very full of all kinds of opportunities. You can play hidden object levels. If you want to. If not, you can play dominos. How about that? This part with dominos is kind of new to the genre. The mini-games seem to be a bit unique too. The old games look a bit fresh and sometimes form a multipuzzle mini-game. 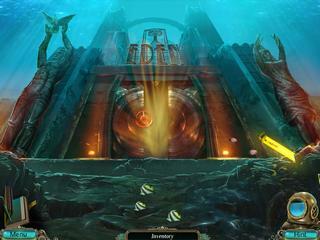 All that is played in one the three levels of difficulty. There is a map to help you out with the tasks to accomplish (but it is not available in the expert mode). There are also achivement to strive for in case you are one of the competitive players. The game is really worth your attention. It is full of so many things to attract the genre fans. 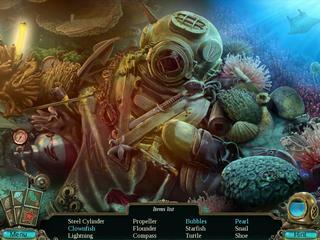 This is Abyss: The Wraiths of Eden review. Download this game here.